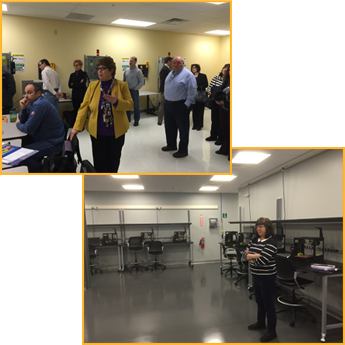 As true business and educational partners, NFIEC courses offer educators in the Western New York community occupational awareness programs through discussions, presentations, and tours. Teachers can earn in-service credit while learning about the WNY Community. Educators attend meetings at various businesses, industry or other locations throughout the region. Many of the business leaders are eager to share their real-life knowledge of what skills and characteristics they are looking for to create successful employees. In turn, the educators take these experiences back to the classroom and incorporate this knowledge into their lessons. Teachers and students not only learn about careers, but they also learn about all the great things Western New York has to offer. The Commitment to Education Awards Breakfast is an annual celebration held each spring designed to honor those industry leaders who have allowed us to live our mission and have partnered with schools to foster student success in the workplace. Schools nominate business partners and they are recognized for their vision in developing partnerships. Working collaboratively with organizations, NFIEC offers programs for teachers such as Money Skills - a financial literacy program in conjunction with the Western New York Service Council, Junior Achievement, WNY Alliance of Chambers. NFIEC also supports and inform members about local business by providing tours and information sessions. Currently, we are updating and soliciting local business partners to who are willing to speak to students in their areas of expertise through our Speaker's Bureau. Over 300 junior and seniors from 12 WNY high schools participated in the first annual student conference aimed at informing students on practices of dining etiquette, soft skills attainment, and important next steps after high school. A keynote address by Jon Sptiz from Z80 Labs kicked off the program and provided students with important lessons learned on finding career opportunities after both high school and college. 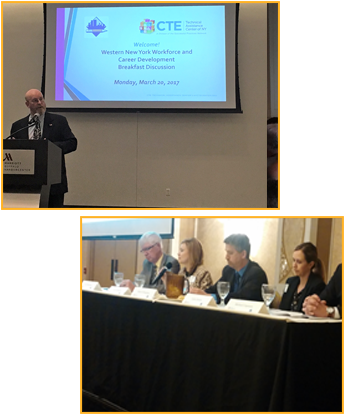 Sponsors of the conference included the WNY National Academy of Finance Regional Advisory Board, State Farm Insurance, the NYS Career and Technical Education Technical Assistance Center and NIFEC. John Bourdage, Bourdage Consultanting, provided two seatings of etiquette luncheon workshops for students and business representatives from NAF and NFIEC. Additionally, 14 WNY colleges and univerisities and business partners provided career and college details for students during breakout sessions.